I notice this section of the military forum is called Air,Land & Sea so here is some thing from the sea.This was used for Navigation by the US Navy during WW2 they did not have GPS in those days from some old timer's in the NAWCC have told me that they would have one on the bridge and a few at differnt spot's on the ship incase one got took out by a direct hit by the enemy and if any one from the ship's crew would tamper with it he could get a courtmartial.This is a model 22 made by Hamilton it's a size 35 with a 21 jewel movement with a wind indicator in a gimbled inner box and a padded outer box I thinks these mite be the spare one's located in differnt spot's on the ship and the model 21 that is far superior on the bridge. Nice! This is really something different. I'm not familiar with Hamilton's models, so perhaps it's an stupid question: is it a pocket watch turned into a ship's watch? 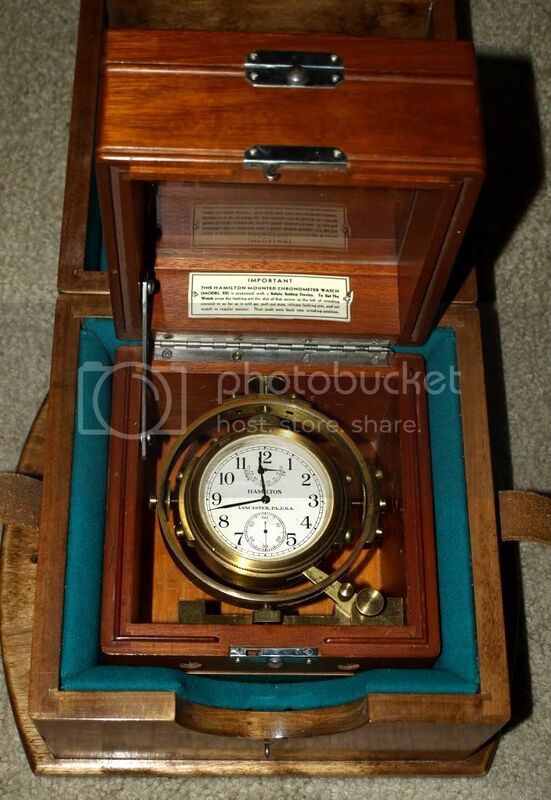 Before WW2 started Europe was the main maker of Chronometer's for ship's navigation.But when WW2 started that dried up for the USA so the USA started usng high grade pocket watch movement's that are railroad grade and even car clock's that were up graded with wind indicator's and they were put in gimbled boxed.And later Hamilton won the contract for the Navy with some new design's with the model 21 with a fusee style movement and the model 22 that is like a very large pocket watch movement.The model 22 came in a chronometer style gimbled box and in a pocket watch style also cased in wooden boxes. Re-readting the posting and your answer on a very large monitor now. The watch, the case and the movement even look better now! 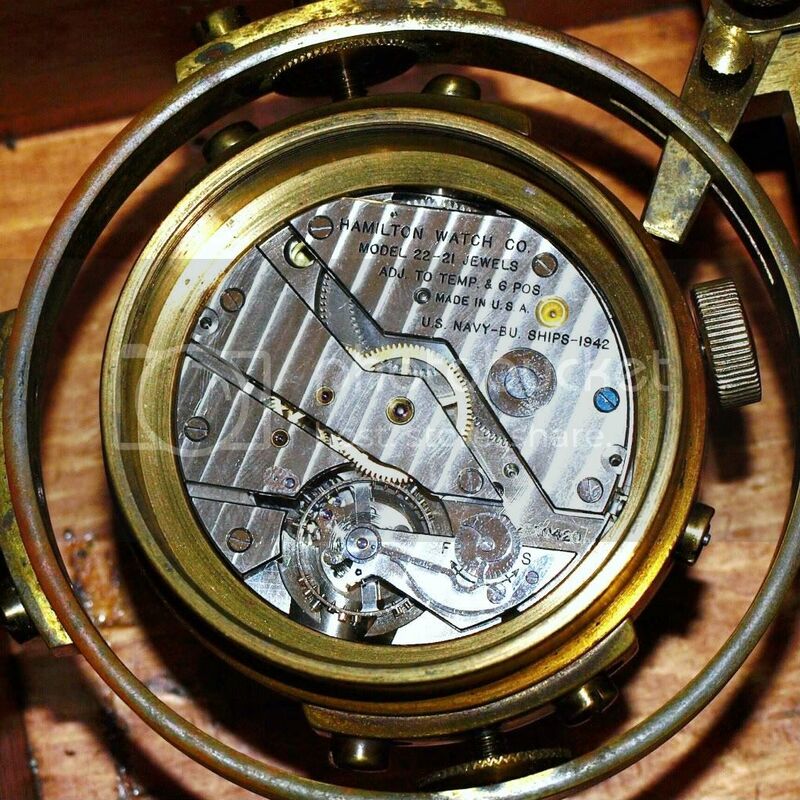 Another very interesting post, Mike - a superb chronometer.